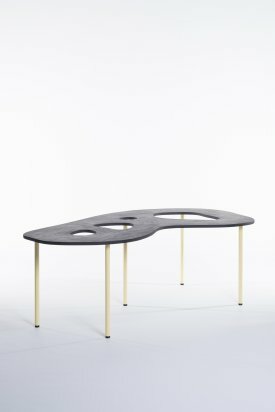 The expansive openings – not to say cut-outs or gaps – in the actual central storage and work areas may make this table seem extremely unpractical, but when put to actual use it turns out to be an absolutely congenial realization of contemporary conventions. 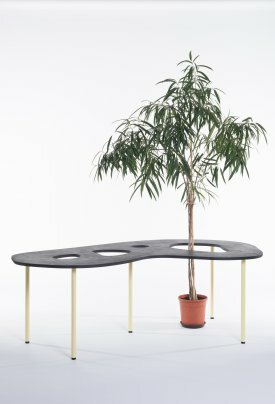 After all, its designer, Max Negrelli, does not base the dimensions of these areas on “business as usual” – namely, large areas that in most cases are then self-consciously decorated with fruit bowls, flower vases, or similar placeholders – but on the real space requirements of someone who sporadically eats or works at this table. And this requirement is, in fact, limited, and does not correspond to the dimensions of a table decked out for Sunday brunch. Strictly speaking, in most cases one makes do with an arm-long and arm-wide rectangle or strip, similar to the zoning at a bar counter. It is exactly this understanding of space that Negrelli applies to his design. 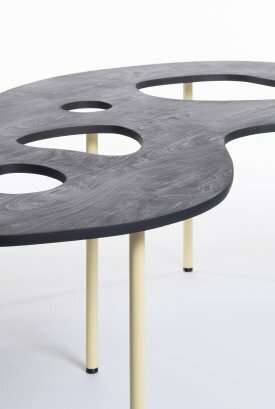 The loopy layout results in completely new functional and performative possibilities for the center of the table and actually elevates this design to an astonishing (but at the same time natural) concept.